Such a grand, expensive gesture is proof of Xian's love, admiration, and sincerity, right? WRONG. 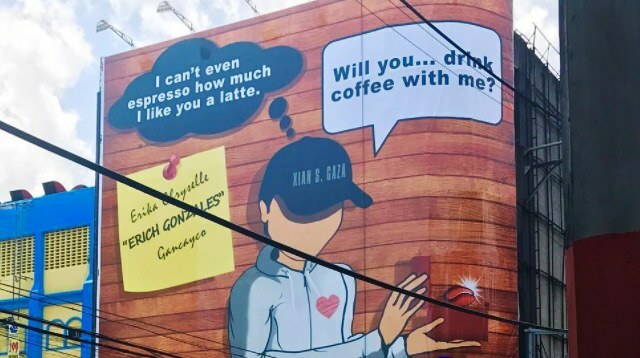 The internet blew up yesterday after photos of a billboard with a message asking actress Erich Gonzales for a coffee date went viral. Businessman Xian Gaza, who seems to paint himself as extremely wealthy on social media, basically spent six figures to ask Erich out. Such a grand, expensive gesture is proof of Xian's love, admiration, and sincerity, right? While a lot of people thought that the billboard was sweet, a lot more thought that it was, at the very least, creepy or given a whole lot of the benefit of doubt, a business opportunity (Xian denied the latter, so he basically admitted to being creepy). That is, I'm assuming that a lot of people found the gesture romantic because news reports said so; all I could find on social media were folks that thought that there was something wrong with it, aside from a total lack of graphic design sensibilities. Why use a billboard to ask a celebrity out? A celebrity you’ve met once, who probably doesn’t even remember you. Why go on social media to say that you’ve taken the warm glow of that one meeting on 29 flights, then lambast commenters for calling you a braggart? Using a billboard means that a. You’re obviously rich and have money to burn, and want everyone to know it; b. That despite your wealth, you have no way of reaching the object of your obsession (because that’s essentially what Erich is in this scenario: an object, and an obsession) through regular means or are too lazy to do so (it isn’t hard; people with less money have done it); and c. You think that a public display of affection will automatically get you a "yes," especially since the billboard explicitly shows off your wealth and who wouldn’t say no to a rich man? He met the actress once, then obsessed about her forever after. Never did he try to seek her out as a friend (as far as I can tell). All he did was keep her on her pedestal, a perfect, untouchable beacon devoid of any of Erich's actual thoughts, feelings, and actions; she isn’t a person, she’s a construct, an object that he believes will make his life better. That Xian used a billboard to ask Erich out for coffee assumes that she’ll say yes because of two things: First, because a billboard is terribly public and there will be a lot of pressure on her to say "yes" and second, because he is rich enough to advertise on a billboard for no reason except to woo her. This implies that Xian thinks that women can be manipulated through guilt ("He spent so much for it, the least you can do is say yes.") or embarrassment ("Say 'yes' so you can keep your public image as a 'nice girl.'") and that dazzling a woman with money is a sure way to her heart. Both are insults to Erich in particular, and women in general. Xian also had posts (that he’s since taken down) of a bunch of makeup that he planned to give Erich. Not only did he post pictures of the products, he also posted a photo of himself holding the receipt to show that he really bought the stuff, then gets mad and calls people jealous when they call him out for bragging. Bragging aside, his social media posts show that he’s the kind of person who thinks that being rich automatically gets you a lot of respect. Sure, it does, in many circles, but do you really want to be liked for your money and not your personality? Having people love you because of your wealth is a lazy way to get approval, and one that doesn’t last, at that. "Hi Darls!!! How are you? Hahaha!!! Ang cute ng effort ni Kuya. (His effort is cute!) It's fine. Let's see when I get back. There's nothing wrong naman if we talk over coffee, pero dapat kasama ka (but you should be with me). Hahaha!!!" I’m not going to claim to know what’s going on in Erich's mind, but to me, the message reads as: appreciative—which is par for the course for a Pinoy celebrity who appreciates their fans—though noncommittal, with an inkling of how creepy the whole thing really is ("pero dapat kasama ka"). Erich handled the incident quite gracefully, in a way that didn’t alienate anyone. But then, such nimble sidestepping has been an art that women have been forced to master for centuries, lest they look bad in society. Unfortunately, there are no such societal restrictions on men, which is why guys like Xian can put up a billboard and expect to be called a hero for it.